Socca is a great dish to make when you feel like something pizza-ish (and Paleo diet-friendly), but you’re short on time. A simple, thin batter of garbanzo bean flour, water and salt is mixed together and set aside for a brief rest, very similar to preparing crepes. It cooks up very quickly — first on the stovetop then under a broiler — and results in a flatbread that’s crisp, yet somewhat creamy in the middle. While not the most traditional approach, it’s the perfect carrier for an array of toppings. I played around with a bunch of topping combinations before hitting on my favorite: rosemary with quickly roasted tomatoes and garlic confit and just a touch of Parmesan. Simply subbing out the rosemary for another herb and Parm for a different hard cheese can make a subtle-yet-significant change in the flavor. From all of the trials, I learned that sticking to toppings that cooked (or got reheated) without burning in about one to three minutes under the broiler were ideal — allowing the top of the socca to cook at least most of the way before adding anything is key. And even more important: skipping super wet toppings altogether — let’s just say that a whole ball of burrata thrown on during the last minute of cooking creates a very soggy, yet [barely] edible dish. Just have fun with it! Preheat oven to 450°F. Line a small, rimmed sheet pan with parchment paper. Place tomatoes on paper and toss with 1 teaspoon olive oil. Season with a pinch each Kosher salt and black pepper. Roast in preheated oven for about 10 minutes, or until soft and caramelized in spots. Set aside to cool. While tomatoes roast, prepare socca batter. In a small bowl or 2-cup spouted measuring cup, whisk together garbanzo bean flour and 1/4 teaspoon Kosher salt. Whisk in about half of the water, forming a smooth, lump-free mixture. Whisk in remaining water then set aside to rest for about 30 minutes. While the batter is resting and after the tomatoes are done, turn off oven, carefully arrange oven rack about 6″ from broiler and preheat broiler to high heat. Once batter is through resting, set a 10″ cast iron or another type of ovenproof skillet over medium-high heat. Warm 1 tablespoon of the garlic confit-infused oil until shimmering, shaking pan to coat in an even layer. 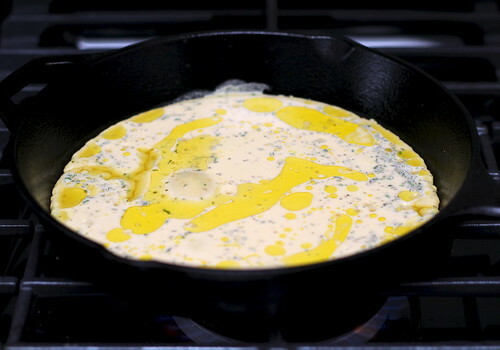 Stir rested socca batter once, and quickly pour into the hot skillet. Drizzle remaining tablespoon oil over top, and sprinkle with chopped rosemary. Cook, popping any bubbles that may surface, until edges are golden brown, about 2 -3 minutes. Transfer pan to under preheated broiler and cook for 4 – 5 minutes, or until top is browned in spots and it appears set. 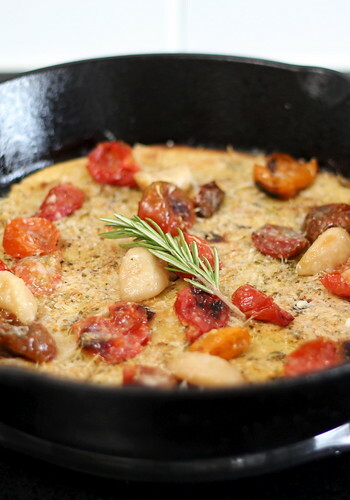 Remove from broiler, arrange garlic cloves and roasted tomatoes on top and sprinkle with Parmesan cheese (if using). Return to broiler and cook for about 1 minute to warm/melt toppings. Allow cooked socca to cool in pan for a couple of minutes before removing to a cutting board and dividing into wedges. Serve hot, seasoning to taste with salt and pepper!